The Winter Festival of Lights transforms Niagara Falls into a beautiful holiday wonderland with millions of sparkling lights and animated displays. Take your family to experience the magical glow of Canada’s largest illumination festival. The Opening Ceremonies of The Winter Festival of Lights will be on Saturday, November 3rd at in Niagara Parks’ Queen Victoria Park! The festivities will run from 11:00AM to 8:00PM with live entertainment, food trucks, interactive displays and special guests. Kids entertainment will run from 11:00AM to 4:00PM with appearances by the Paw Patrol, live music by the MiniPop Kids, the Home Depot kids workshop, the Heartland Forest train, air brush face painting and more! Starting at 4:00PM our feature entertainment takes over the main stage with country music stars Beverley Mahood & Friends including performances by The Julian Taylor Band, Brad Battle, Mac Sheppard, Jamie Warren, Leah Daniels & Beverley Mahood. Firework shows will also light up the sky at Opening Ceremonies at 8:00 & 9:00PM. Admission to Opening Ceremonies is completely free! 12 noon – 4:00PM: Meet Chase, Marshall, Skye and Rubble from the Paw Patrol! 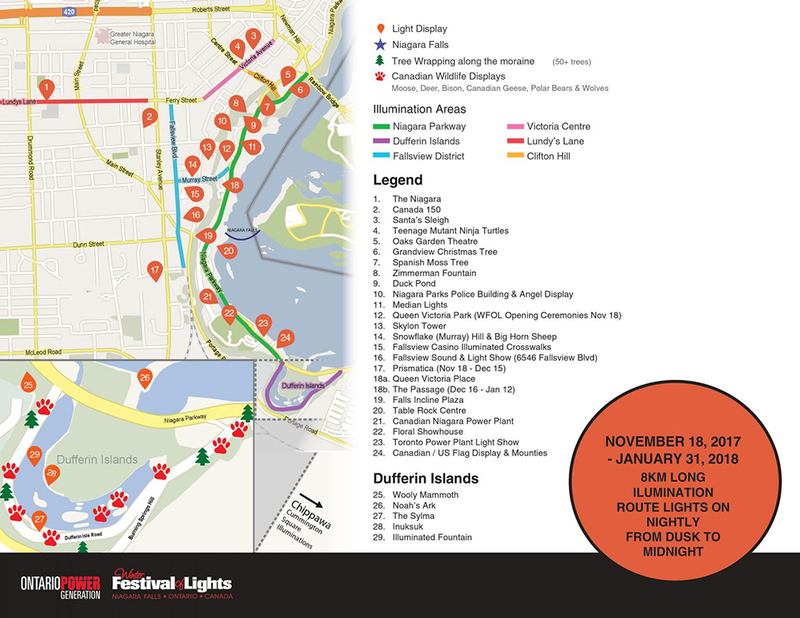 After Opening Ceremonies tour the 8km long illumination route featuring over 3 million lights throughout the Niagara Parks, Dufferin Islands and surrounding areas! For the first time ever, Niagara Falls will host the Cascades of Fire International Fireworks Competition. Presented over 6 weekend nights in November, Cascades of Fire will feature 18-minute pyrotechnic shows synchronized to music. This year’s competition will feature presentations from China, Finland, Brazil, Vietnam, Italy with a special finale by the host country Team Canada. ALL SHOWS START AT 9:00 PM. Dufferin Islands is home to the Festival’s Canadian Wildlife displays including three-dimensional Moose, Deer, Polar Bears, Fox, Bison and Geese. These displays range in height from 4’ to 11’ tall. This winter don’t miss our newest addition to Dufferin Islands- a gigantic Woolly Mammoth as you exit this area! There is no fee to view the illuminations but donations are gratefully accepted by the Festival Ambassadors at the exit of Dufferin Islands (suggested contribution $5 – $10 per car; bus groups $1/person), with proceeds used to enhance the Festival’s lights and displays. The 2018/19 Ontario Power Generation Winter Festival of Lights (WFOL) Winter Fireworks Series is presented by Fallsview Casino and will feature twenty-two fireworks shows during the WFOL Season! The first show of the winter season will take place as part of the Festival’s Opening Ceremonies celebrations in Queen Victoria Park on Saturday, November 3rd, 2018! This will be followed by weekly shows every Friday night at 9PM, each show during the winter schedule will be four minutes long. There will also be bonus fireworks shows during the Holidays, every night from December 22nd – 30th at 9PM. Every evening beginning at dusk, the Falls Illumination transforms Niagara Falls into an incredible, multi-coloured water and light masterpiece. Special lights are housed in the Illumination Tower next to Queen Victoria Place, on the roof of Table Rock Centre at the brink of the Horseshoe Falls, and deep in the Niagara Gorge across from the American Falls. These lights all work together to create a breathtaking view not to be missed. The Falls are also lit in custom colours for short durations to mark significant dates in support of charitable causes. Special colour illuminations are provided courtesy of The Niagara Falls Illumination Board. Deck the Falls Holiday Walking Tour 2017 was a hit! Ticket holders enjoyed pop-up carolers, gourmet food samplings, holiday beverages, entertainers, holiday-themed photo ops, and craft activities in the heart of Niagara Falls’ tourist district. For this year’s walking tour, ticket holders will receive a Deck the Falls Tour Pass booklet with tour information, a map and instructions. Your ONE PRICE Tour Pass includes the vouchers for all of the activities listed below and can be redeemed on ANY of our 6 event nights. Deck the Falls 2018 takes place over the first three weekends of December, Friday and Saturday evenings from 5:00 pm to 10:00 pm. Looking for More Christmas & Holiday Fun? Click Here! We do our best to provide accurate, useful information about event and activities in the Niagara Region. This information (such as times and locations) is gathered from user submissions, press releases, local newspapers, other websites, signs around town and word of mouth. We do our best to confirm details before they are published here. Sometimes details change. Whenever possible, we strongly encourage you to confirm the details before you go.